The municipal solid waste incineration bottom ash (IBA) is increasingly used as a secondary resource for civil engineering and various other applications. IBA contains various metals. The presence of these metals may limit the use of IBA as a secondary resource. This can be overcome by removing metals from IBA. This study focused on determination of metal contents of IBA and leaching of these metals. The results show that calcium (Ca), iron (Fe), aluminum (Al), silicon (Si), and sodium (Na) are the major metals present in IBA. Many other metals ranging from magnesium (Mg) to mercury (Hg) were also present in varying quantities. In the present study, four organic acids, namely, citric, malic, oxalic, and gluconic acids have been used to compare the metal leaching from IBA. The citric acid was found to be the most effective leaching agent. Various process parameters for metal leaching were optimized. It was found that the maximum metal leaching was achieved in 48 h. The 1 M citric acid, 100 mL working volume, 150 rpm, and 30 °C were the optimal conditions to leach 100 wt% Si, Na, Au, Sb, respectively. Around 99 wt% Mg, 95 wt% K, 93 wt% Cd, 88 wt% Al, 84 wt% Ca, 80 wt% Fe, 79 wt% Sr, 77 wt% Pb, Zn, As respectively, 67 wt% Cu, V, Ag respectively, 66 wt% Mn, 64 wt% Co, 56 wt% Cr, 43 wt% Ni, Sn respectively, 40 wt% Se, 21 wt% Ba, 10 wt% Hg were leached using citric acid at optimal conditions. The leaching efficiency decreased with increasing pulp density. 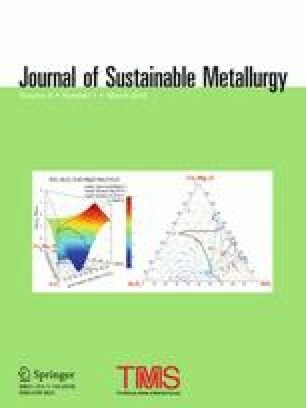 An optimal pulp density for metal leaching was observed at 1% (w/v). The method described in the present study provides an alternative environmentally friendly process to remove metals from IBA. This will facilitate the recycling of metal-free IBA for geotechnical applications. The contributing editor for this article was D. Panias. The authors would like to acknowledge the financial support from the Environment Technology Research Program (ETRP), the National Environment Agency, Singapore (ETRP Nos. 1301 104).